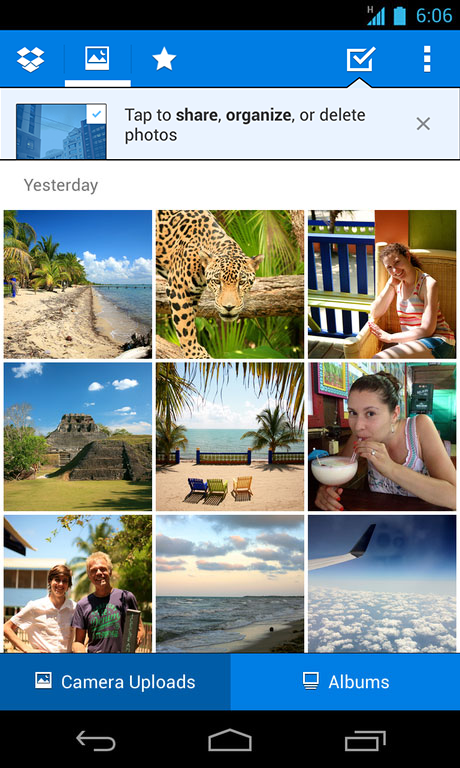 Dropbox for Android has gotten yet another photo-centric update today. The latest version allows you to share collections of photos with friends or family, and they can view them even without a Dropbox account. Dropbox has always allowed you to share photos with a public link to anyone, but this makes it easier to grab a clump of photos and share them all at once. The recent dramatic redesign of Dropbox’ apps displayed a renewed focus on sharing photos, something that the team told me was a big way that people use its product. And if people are using Dropbox as a photo repository, why not make it the friendliest place possible for those photos? If this ability sounds familiar then you’re probably thinking of Public Photo Streams, something that Apple introduced in iOS 6. Sharing a collection of photos via a link allows those you share it with to peek at those collections, even if they don’t have an iCloud account. To use the feature, you tap on the share/organize icon in the upper right corner and choose the photos that you’d like people to see. You can then collect those in an album or just share the link out via email, Facebook or Twitter. This continues Dropbox’ current path of movement into becoming a huge photo sharing service. After adding automatic uploads, the team said that it saw an immense uptick in how many photos people were storing on Dropbox. It recently made the ability to do this over cellular connections more prominent in its interface. It also recently acquired photo service Snapjoy. It seems likely that this will come to the iOS version shortly as well.